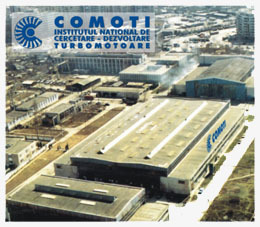 Founded in 1985, under the name of Scientific Research and Technological Engineering for Aviation Engines within INCREST, former aviation institute, COMOTI becomes in 1996, as a result of institutional evaluation and certification, COMOTI Turbine Engines Research and Development Institute . COMOTI Turbine Engines Research and Development Institute is the only unit in Romania specialized in development and integration of scientific research, constructive and technological design, manufacturing, experimentation, testing, technological transfer and innovation in the field of aviation turbine engines, gas turbine industrial machines and high speed blade machines. Constant concern led to high reliability industrial products: power sets, electrical or turbine natural gas compressor sets and gas turbine cogenerative groups. The experience gathered in the field of high speed blade machines allowed development, in own conception, of series of electrical centrifugal natural gas or air compressors and electrical centrifugal air blowers in a large variety of flows and pressures, making COMOTI the only national producer for such complex equipments. 2. Institute's involvement in seven high enterprise European projects, within PC V and PC VI Frame Programs and partnership projects with GENERAL ELECTRIC – USA, NUOVO PIGNONE – Italy, G.H.H. RAND, M.T.U. AEROENGINES, DLR - Space and Aviation German Institute – Germany, SNECMA, AIRBUS-F, ONERA, VIBRATEC – France. I.N.C.D.T. COMOTI is working according to a certified quality assurance system, in conformity with SR EN ISO 9001-2000, guided by the Total Quality Management theory. I.N.C.D.T. COMOTI supplies assembling, start up, endurance tests and service for all delivered products in warranty and post warranty period. Human resources quality and appropriate management strategy made I.N.C.D.T. COMOTI's products be a constant presence in most various areas and used by more and more beneficiaries from machine engineering industry, crude oil and natural gas extraction industry, petrochemical industry, energetic industry, construction materials industry, metallurgical industry and in the field of environment protection and environment friendly industrial systems. Physics and chemical testing laboratory . Specific proficiency in supplied services, partnerships. 5. high speed blade machines.